The display read: “Not a DC resident? Need a place to stay? Try our shithole.” The statement was complemented by grinning poop emojis. According to CNN, award-winning editor, video journalist and multimedia artist Robin Bell claimed the display was about the 15th projection he had done on the famed hotel. Bell said, in the interview, that the projection was up for about 40 minutes. 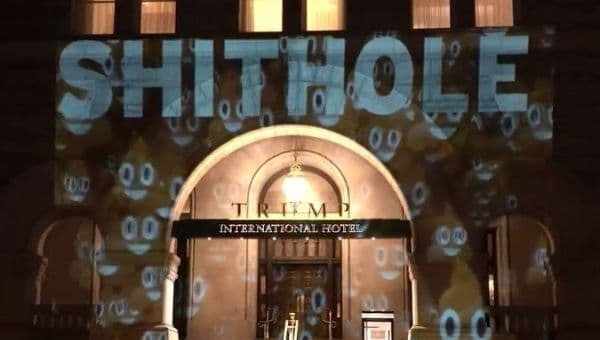 Video footage on Bell’s Twitter showed the word “SHITHOLE” with the poop emojis projected on the wall of the hotel, on Saturday. There was also an arrow pointing to the arched doorway. Bell previously projected “Experts agree: Trump is a pig”, “Pay Trump bribes here” as well as “we are all responsible to stand up and end white supremacy” on the front of the building. Trump reportedly used the term last week, during an immigration reform meeting with litigators, to describe immigrants from those countries. The U.S. president allegedly asked the lawmakers “Why do we want all these people from ‘shithole countries’ coming here?” Trump has subsequently denied making the comment. The alleged comment has drawn the ire of Haiti’s Caribbean neighbors, who largely denounced the United States leader, in addition to most of the wider international community. The remark has sparked at least two resignations: former Marine Corps helicopter pilot and career diplomat U.S. ambassador to Panama John Feeley and acting assistant secretary of the State Department’s Bureau of Population, Refugees and Migration, Simon Henshaw. The Trump administration revoked the temporary protected status of Haitians, which had been in place since the devastating 2010 earthquake struck the Caribbean country destroying its infrastructure and claimed the lives of 230,000 people.